Kittie (known as Katie by her family) grew up on a beautiful farm in Carnation, Washington, riding horses and exploring the woods with her dog. As part of her Associate of Arts and Sciences Degree at Bellevue College, she excelled in hand-drawn animation classes (and was published in her mentor Tony White’s book, How to Make Animated Films) but decided she wanted to be an oil painter. She received her Bachelor of Fine Arts Degree in Studio Art from Central Washington University in 2016, where she discovered her love of making three-dimensional objects and using her painting skills to give them sophisticated surface qualities. 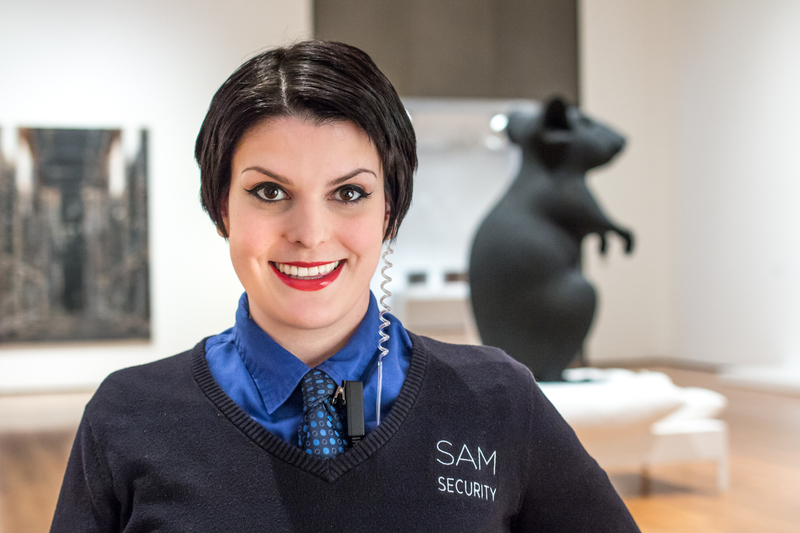 Working as a Visitor Services Officer in the galleries of the Seattle Art Museum keeps her engaged in her greatest interest—art history. SAM: Jacob Lawrence’s The Migration Series opened January 21 and is running until April 23. What is your favorite piece in this series? McAllister: Every painting in The Migration Series is full of earth tones, so Panel 5 struck me for its vibrant colors and total absence of browns. A black locomotive speeding through the deep blue night, with its yellow bell swinging in the force of the wind and light penetrating the darkness ahead, gleams like an emblem of hope for the migrants leaving deplorable living situations behind. The yellow paint of the bell is even brighter than the bold yellow seen throughout the series, perhaps emphasizing it as a symbol of liberty and progress. The huge Mann und Maus sculpture by Katharina Fritsch, for the BIG reactions it always gets! I often hear adults say that waking up to giant vermin on their bed is their worst nightmare, while children perceive the “mousy” as cute and funny; one child thought he got so big from eating too much cheese! I see dark symbolism in the piece and feel a little uneasy when posted in its imposing presence. One of my favorite works is a white ladder that, when you climb to the top and look through a magnifying glass hanging by a delicate chain, you can find the tiny word, “Yes” written on the white ceiling. John Lennon fell in love with Yoko when he felt refreshed by her positive message in this interactive art piece. Make a day of it! I always recommend starting back in time on the fourth floor with our most ancient art objects, and working your way back to the present with our more contemporary works on the third floor. SAM celebrates diversity and is a safe space to be yourself and unabashedly explore the eccentric world of art. Recently I had a painting in the Erotica exhibition on Capitol Hill for Second Thursday Art Walk—it was such a hoot! Now that I’m finished with school I have time to get back into my guitar and I love spending lazy days just journaling. My shorthaired black cat, Tobias Funke, always demands my attention, and I’m simply enjoying my time with friends and family now that I’m back in Seattle. I’m always making little plans and schemes for my creative notions—working at Seattle Art Museum keeps my creativity fueled!